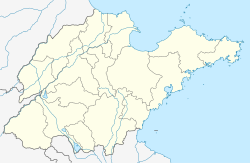 Zhaoyuan (Chinese: 招远) is a county-level city within the prefecture-level city of Yantai, Shandong Province, China located on the seashore of the Bohai Sea. Zhaoyuan is well known for its abundant gold deposit and production. In 2002 Zhaoyuan was named "China's Gold City" by China's gold association. Gold was discovered in the Tang dynasty. The Tang dynasty started in 618AD, and ended in 907AD. The name “Zhaoyuan” was created by an emperor of The North Song dynasty in 1131AD. In 1949, Communist China was founded. Zhaoyuan suffered several political movements and the economy did not recover effectively. In 1978, Deng Xiaoping changed the economic system with the policy of Reform and Opening. People in Zhaoyuan became richer than before with the rapid growth of industry. Zhaojin Mining - Largest gold producer in Shandong and headquartered in Zhaoyuan. "Asia's largest statue of Ao" (a mythical giant turtle Chinese ), 15 m tall and 20 m long, in Luoshan State Forest Park (罗山国家森林) It can be easily seen on Google Maps satellite photos at 37°27′36″N 120°28′22″E﻿ / ﻿37.46000°N 120.47278°E﻿ / 37.46000; 120.47278.